^ Shipley, Joseph T. (2001). The Origins of English Words: A Discursive Dictionary of Indo-European Roots. JHU Press. ISBN 978-0-8018-6784-2. http://books.google.com/?id=m1UKpE4YEkEC&pg=PA83. ^ a b Garrett, Donald E. (1998). Borates: handbook of deposits, processing, properties, and use. Academic Press. pp. 102; 385–386. ISBN 0-12-276060-3. ^ a b Gay Lussac, J.L. and Thenard, L.J. (1808) "Sur la décomposition et la recomposition de l'acide boracique," Annales de chimie [later: Annales de chemie et de physique], vol. 68, pp. 169–174. ^ a b Davy H (1809). “An account of some new analytical researches on the nature of certain bodies, particularly the alkalies, phosphorus, sulphur, carbonaceous matter, and the acids hitherto undecomposed: with some general observations on chemical theory”. Philosophical Transactions of the Royal Society of London 99: 33–104. doi:10.1098/rstl.1809.0005. http://books.google.com/books?id=gpwEAAAAYAAJ&pg=PA140#v=onepage&q&f=false. ^ Weeks, Mary Elvira (1933). “XII. Other Elements Isolated with the Aid of Potassium and Sodium: Beryllium, Boron, Silicon and Aluminum”. The Discovery of the Elements. Easton, PA: Journal of Chemical Education. p. 156. ISBN 0-7661-3872-0. http://books.google.com/books?id=SJIk9BPdNWcC&pg=PA156. ^ ベルセリウスはホウフッ化塩の還元、特にホウフッ化カリウムを金属カリウムとともに加熱することでホウ素を単離した。以下を参照のこと。Berzelius, J. (1824) "Undersökning af flusspatssyran och dess märkvärdigaste föreningar" (Part 2) (Investigation of hydrofluoric acid and of its most noteworthy compounds), Kongliga Vetenskaps-Academiens Handlingar (Proceedings of the Royal Science Academy), vol. 12, pp. 46–98; 特にpp. 88ff. Reprinted in German as: Berzelius, J. J. (1824) "Untersuchungen über die Flußspathsäure und deren merkwürdigste Verbindungen", Poggendorff's Annalen der Physik und Chemie, vol. 78, pages 113–150. ^ Weintraub, Ezekiel (1910). “Preparation and properties of pure boron”. Transactions of the American Electrochemical Society 16: 165–184. http://books.google.com/books?id=e5USAAAAYAAJ&pg=PA165#v=onepage&q&f=false. ^ a b Laubengayer, A. W.; Hurd, D. T.; Newkirk, A. E.; Hoard, J. L. (1943). “Boron. I. Preparation and Properties of Pure Crystalline Boron”. Journal of the American Chemical Society 65 (10): 1924–1931. doi:10.1021/ja01250a036. ^ Borchert, W. ; Dietz, W. ; Koelker, H. (1970). “Crystal Growth of Beta–Rhombohedrical Boron”. Zeitschrift für Angewandte Physik 29: 277. OSTI 4098583. ^ a b c d e Holleman, Arnold F.; Wiberg, Egon; Wiberg, Nils; (1985). “Bor” (German). Lehrbuch der Anorganischen Chemie (91–100 ed.). Walter de Gruyter. pp. 814–864. ISBN 3-11-007511-3. ^ N. N. Greenwood、A. Earnshaw (1997). Chemistry of the Elements. Elsevier. pp. 152, 155. ISBN 0080501095. ^ Engler, M. (2007). “Hexagonal Boron Nitride (hBN) – Applications from Metallurgy to Cosmetics”. Cfi/Ber. DKG 84: D25. ISSN 0173-9913. http://www.esk.com/uploads/tx_userjspresseveroeff/PR_0712_CFI_12-2007_Hexagonales-BN_e_01.pdf. ^ Greim, Jochen and Schwetz, Karl A. (2005). Boron Carbide, Boron Nitride, and Metal Borides, in Ullmann's Encyclopedia of Industrial Chemistry. Wiley-VCH: Weinheim. doi:10.1002/14356007.a04_295.pub2. ^ 土浦宏紀、栂裕太、守谷浩志、佐久間昭正 (2009). “Nd2Fe14B永久磁石の磁気異方性”. 固体物理 (アグネ技術センター) 44 (10). http://www.apph.tohoku.ac.jp/kiso/files/0910_kotai.pdf 2014年1月25日閲覧。. ^ Wiberg 2001, p. 930. ^ a b Housecroft & Sharpe 2008, p. 331. ^ Donohue 1982, p. 48. ^ Lundström, T (2009). “The solubility in the various modifications of boron”. In Zuckerman, J. J.; Hagen, A. P.. Inorganic reactions and methods. Vol. 13: The formation of bonds to group-I, -II, and -IIIB elements. New York: John Wiley & Sons. pp. 196–97. ISBN 0470145498. ^ a b Oganov, A. R.; Chen, J.; Ma, Y.; Glass, C. W.; Yu, Z.; Kurakevych, O. O.; Solozhenko, V. L. (12 Feb). “Ionic high-pressure form of elemental boron”. Nature 457 (7027): 863–868. arXiv:0911.3192. Bibcode: 2009Natur.457..863O. doi:10.1038/nature07736. PMID 19182772. ^ Wentorf Jr, R. H. (1965). “Boron: Another Form”. Science 147 (3653): 49–50 (Powder Diffraction File database (CAS number 7440–42–8)). Bibcode: 1965Sci...147...49W. doi:10.1126/science.147.3653.49. PMID 17799779. ^ Hoard, J. L.; Sullenger, D. B.; Kennard, C. H. L.; Hughes, R. E. (1970). “The structure analysis of β-rhombohedral boron”. J. Solid State Chem. 1 (2): 268–277. Bibcode: 1970JSSCh...1..268H. doi:10.1016/0022-4596(70)90022-8. ^ Will, G.; Kiefer, B. (2001). “Electron Deformation Density in Rhombohedral a-Boron”. Zeitschrift für anorganische und allgemeine Chemie 627 (9): 2100. doi:[[doi:10.1002%2F1521-3749%28200109%29627%3A9%3C2100%3A%3AAID-ZAAC2100%3E3.0.CO%3B2-G|10.1002/1521-3749(200109)627:9<2100::AID-ZAAC2100>3.0.CO;2-G]]. ^ Talley, C. P.; LaPlaca, S.; Post, B. (1960). “A new polymorph of boron”. Acta Crystallogr. 13 (3): 271. doi:10.1107/S0365110X60000613. ^ Solozhenko, V. L.; Kurakevych, O. O.; Oganov, A. R. (2008). “On the hardness of a new boron phase, orthorhombic γ-B28”. Journal of Superhard Materials 30 (6): 428–429. doi:10.3103/S1063457608060117. ^ a b c Zarechnaya, E. Yu. ; Dubrovinsky, L.; Dubrovinskaia, N.; Filinchuk, Y.; Chernyshov, D.; Dmitriev, V.; Miyajima, N.; El Goresy, A. et al. (2009). “Superhard Semiconducting Optically Transparent High Pressure Phase of Boron”. Phys. Rev. Lett. 102 (18): 185501. Bibcode: 2009PhRvL.102r5501Z. doi:10.1103/PhysRevLett.102.185501. PMID 19518885. ^ Nelmes, R. J.; Loveday, J. S.; Allan, D. R.; Hull, S.; Hamel, G.; Grima, P.; Hull, S. (1993). “Neutron- and x-ray-diffraction measurements of the bulk modulus of boron”. Phys. Rev. B 47 (13): 7668. Bibcode: 1993PhRvB..47.7668N. doi:10.1103/PhysRevB.47.7668. ^ Madelung, O., ed (1983). Landolt-Bornstein, New Series. 17e. Berlin: Springer-Verlag. ^ Kumashiro, Y, ed (2000). “Boron and boron-rich compounds”. Electric Refractory Materials. New York: Marcel Dekker. pp. 589‒654 (633, 635). ISBN 082470049X. ^ Barth, S. (1997). “Boron isotopic analysis of natural fresh and saline waters by negative thermal ionization mass spectrometry”. Chemical Geology 143 (3–4): 255–261. doi:10.1016/S0009-2541(97)00107-1. ^ Liu, Z. (2003). “Two-body and three-body halo nuclei”. Science China Physics, Mechanics & Astronomy 46 (4): 441. Bibcode: 2003ScChG..46..441L. doi:10.1360/03yw0027. ^ a b c 吉田和久、竹原公、原田義一 (2013). “ホウ素の新しい電気化学的分析方法”. THE CHEMICAL TIMES (関東化学) 228 (2). http://www.kanto.co.jp/times/pdf/CT_228_01.pdf. ^ 篠原敏雄 ほか (2003). “陰イオン交換分離/誘導結合プラズマ発光分析法による鉄鋼中ホウ素の定量”. 分析化学 (日本分析化学会) 52 (9): 851. doi:10.2116/bunsekikagaku.52.851. https://doi.org/10.2116/bunsekikagaku.52.851. ^ 閔庚薫、鈴木俊夫. “ガラス構造の分光学的解析技術”. 旭硝子研究報告 59: 29-30. https://www.agc.com/english/rd/library/2009/59-05.pdf. ^ Haruyuki Yasui, Kaoru Awazu, Noriaki Ikenaga, Noriyuki Sakudo (2008). “Synthesis and characterization of BN thin films prepared by plasma MOCVD with organoboron precursors”. Vacuum 83 (3): 582-584. doi:10.1016/j.vacuum.2008.04.030. ^ 余語利信、松雄茂、中重治 (1987). “トリアンモニアデカボランとアンモニアからの窒化ホウ素の合成(2. 気相反応法)(<特集>新技術によるセラミックスの合成と評価(I))”. 窯業協會誌 (社団法人日本セラミックス協会) 95 (No.1097): 105. NAID 110002313558. ^ Edward Anders, Mitsuru Ebihara (1982). “Solar-System Abundances of the Elements.”. Geochimica et Cosmochimica Acta 46 (11): 2363–2380. doi:10.1016/0016-7037(82)90208-3. ^ 中村航 (2013). “超新星爆発における希少元素合成”. 天文月報 (日本天文学会) 第106巻 (9月号): 598-601. http://www.asj.or.jp/geppou/contents/2013_09.html. ^ Kistler, R. B. (1994). “Boron and Borates”. Industrial Minerals and Rocks (Society of Mining, Metallurgy and Exploration, Inc.): 171–186. http://kisi.deu.edu.tr/cahit.helvaci/Boron.pdf. ^ Zbayolu, G.; Poslu, K. (1992). “Mining and Processing of Borates in Turkey”. Mineral Processing and Extractive Metallurgy Review 9 (1–4): 245–254. doi:10.1080/08827509208952709. ^ Kar, Y.; Şen, Nejdet; Demİrbaş, Ayhan (2006). “Boron Minerals in Turkey, Their Application Areas and Importance for the Country's Economy”. Minerals & Energy – Raw Materials Report 20 (3–4): 2–10. doi:10.1080/14041040500504293. ^ Berger, L. I. (1996). Semiconductor materials. CRC Press. pp. 37–43. ISBN 0-8493-8912-7. ^ 谷内廣明、下条純、萬谷健一 (12 2003). “濃縮ボロン製品の今後の展望”. 神戸製鋼技報 (神戸製鋼) 53issue=3. http://www.kobelco.co.jp/technology-review/pdf/53_3/023-025.pdf 2014年1月19日閲覧。. ^ The Economics of Boron, 11th edition. Roskill Information Services, Ltd.. (2006). ISBN 0-86214-516-3. ^ 谷口英嗣、町田嗣樹、齋藤洋輔 (2012). “地学現象の再現実験 : 洗濯糊（polyvinyl alcohol: PVA) スライムを用いた粘弾性流体の再現”. 城西大学研究年報. 自然科学編 (城西大学) 35: pp. 13-14. http://libir.josai.ac.jp/il/meta_pub/G0000284repository_JOS-09149775-3502. ^ Pfaender, H. G. (1996). Schott guide to glass (2 ed.). Springer. p. 122. ISBN 0-412-62060-X. ^ Layden, G. K. (1973). “Fracture behaviour of boron filaments”. Journal of Materials Science 8 (11): 1581–1589. Bibcode: 1973JMatS...8.1581L. doi:10.1007/BF00754893. ^ Cooke, Theodore F. (1991). “Inorganic Fibers—A Literature Review”. Journal of the American Ceramic Society 74 (12): 2959–2978. doi:10.1111/j.1151-2916.1991.tb04289.x. ^ Johansson, S.; Schweitz, Jan-Åke; Westberg, Helena; Boman, Mats (1992). “Microfabrication of three-dimensional boron structures by laser chemical processing”. Journal Applied Physics 72 (12): 5956–5963. Bibcode: 1992JAP....72.5956J. doi:10.1063/1.351904. ^ May, Gary S.; Spanos, Costas J. (2006). Fundamentals of semiconductor manufacturing and process control. John Wiley and Sons. pp. 51–54. ISBN 0-471-78406-0. ^ Sherer, J. Michael (2005). Semiconductor industry: wafer fab exhaust management. CRC Press. pp. 39–60. ISBN 1-57444-720-3. ^ Zschech, Ehrenfried; Whelan, Caroline and Mikolajick, Thomas (2005). Materials for information technology: devices, interconnects and packaging. Birkhäuser. p. 44. ISBN 1-85233-941-1. ^ 小澤純夫 (2010). “資源問題に直面するモータ用永久磁石の研究動向と課題”. 科学技術動向 (科学技術・学術政策研究所) 2010年9月号: p. 12. http://www.nistep.go.jp/achiev/ftx/jpn/stfc/stt114j/report1.pdf. ^ Gogotsi, Y. G. and Andrievski, R.A. (1999). Materials Science of Carbides, Nitrides and Borides. Springer. pp. 270–270. ISBN 0-7923-5707-8. ^ Weimer, Alan W. (1997). Carbide, Nitride and Boride Materials Synthesis and Processing. Chapman & Hall (London, New York). ISBN 0-412-54060-6. ^ Komatsu, T.; Samedima, M.; Awano, T.; Kakadate, Y.; Fujiwara, S. (1999). “Creation of Superhard B–C–N Heterodiamond Using an Advanced Shock Wave Compression Technology”. Journal of Materials Processing Technology 85 (1–3): 69–73. doi:10.1016/S0924-0136(98)00263-5. ^ Wentorf, R. H. (1957). 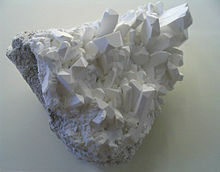 “Cubic form of boron nitride”. J. Chem Phys. 26 (4): 956. Bibcode: 1957JChPh..26..956W. doi:10.1063/1.1745964. ^ Schmidt, Jürgen; Boehling, Marian; Burkhardt, Ulrich; Grin, Yuri (2007). “Preparation of titanium diboride TiB2 by spark plasma sintering at slow heating rate”. Science and Technology of Advanced Materials 8 (5): 376. Bibcode: 2007STAdM...8..376S. doi:10.1016/j.stam.2007.06.009. ^ Solozhenko, V. L.; Kurakevych, Oleksandr O.; Le Godec, Yann; Mezouar, Mohamed; Mezouar, Mohamed (2009). “Ultimate Metastable Solubility of Boron in Diamond: Synthesis of Superhard Diamondlike BC5”. Phys. Rev. Lett. 102 (1): 015506. Bibcode: 2009PhRvL.102a5506S. doi:10.1103/PhysRevLett.102.015506. PMID 19257210. ^ Qin, Jiaqian; He, Duanwei; Wang, Jianghua; Fang, Leiming; Lei, Li; Li, Yongjun; Hu, Juan; Kou, Zili et al. (2008). “Is Rhenium Diboride a Superhard Material?”. Advanced Materials 20 (24): 4780–4783. doi:10.1002/adma.200801471. ^ “原子力用 B4C 制御材”. セラミックス 42 (No. 8): 610. (2007). http://www.ceramic.or.jp/museum/contents/pdf/2007_8_04.pdf. ^ 松尾義之 (2011). “鈴木 章　北海道大学名誉教授　人生を決めた２冊の本”. 産学官連携ジャーナル 7 (No. 9): pp.5-15. https://sangakukan.jp/journal/journal_contents/2011/09/articles/1109-02/1109-02_article.html. ^ Blevins, Dale G.; Lukaszewski, KM (1998). “Functions of Boron in Plant Nutrition”. Annual Review of Plant Physiology and Plant Molecular Biology 49: 481–500. doi:10.1146/annurev.arplant.49.1.481. PMID 15012243. ^ Nielsen, Forrest H. (1998). “Ultratrace elements in nutrition: Current knowledge and speculation”. The Journal of Trace Elements in Experimental Medicine 11 (2–3): 251–274. doi:[[doi:10.1002%2F%28SICI%291520-670X%281998%2911%3A2%2F3%3C251%3A%3AAID-JTRA15%3E3.0.CO%3B2-Q|10.1002/(SICI)1520-670X(1998)11:2/3<251::AID-JTRA15>3.0.CO;2-Q]]. ^ Zook, E. G. (1965). “Total boron”. J. Assoc. Off Agric. Chem 48: 850. ^ United States. Environmental Protection Agency. Office of Water, U. S. Environmental Protection Agency Staff (1993). Health advisories for drinking water contaminants: United States Environmental Protection Agency Office of Water health advisories. CRC Press. p. 84. ISBN 0-87371-931-X. http://books.google.com/?id=trUdm-GXchIC&pg=PA84. ^ Vithana, En; Morgan, P; Sundaresan, P; Ebenezer, Nd; Tan, Dt; Mohamed, Md; Anand, S; Khine, Ko; Venkataraman, D; Yong, Vh; Salto-Tellez, M; Venkatraman, A; Guo, K; Hemadevi, B; Srinivasan, M; Prajna, V; Khine, M; Casey, Jr; Inglehearn, Cf; Aung, T (July 2006). “Mutations in sodium-borate cotransporter SLC4A11 cause recessive congenital hereditary endothelial dystrophy (CHED2)”. Nature Genetics 38 (7): 755–7. doi:10.1038/ng1824. ISSN 1061-4036. PMID 16767101. ^ Diego G. Ogando et al. (2013-10-1). “SLC4A11 is an EIPA-sensitive Na+ permeable pHi regulator”. American Journal of Physiology - Cell Physiology 305 (7): 16-27. doi:10.1152/ajpcell.00056.2013. ^ Garrett, Donald E. (1998). Borates. Academic Press. p. 385. ISBN 0-12-276060-3. http://books.google.com/?id=imMJJP5T5rsC&pg=PA385. Housecroft, C. E.; Sharpe, A. G. (2008). Inorganic chemistry (3rd ed.). Harlow: Pearson Education. ISBN 978-0-13-175553-6.